Max Axiom is a super-cool, super-scientist. Using powers he acquire in a freak accident, Max demonstrates and explains science. Illustrated by Smith, Tod G.
You never had a science teacher like this! 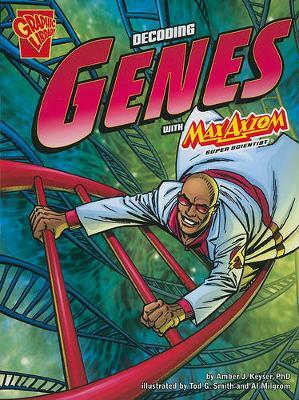 Max Axiom is a super-cool super-scientist. Using powers he acquired in a freak accident. Max demonstrates and explains science in ways never before seen in the classroom. Whether shrinking down to size of an ant or riding on a sound wave, Max can do whatever it takes to make science super cool and accessible. Amber J. Keyser is a former ballerina and evolutionary biologist who writes both fiction and nonfiction for tweens and teens. Her young adult novels include Pointe, Claw and The Way Back From Broken. Her nonfiction titles include Sneaker Century: A History Of Athletic Shoes, Decoding Genes with Max Axiom Super Scientist, and many other titles. Amber lives in Oregon with her husband, two kids, four chickens, and a dog who looks like a Muppet.